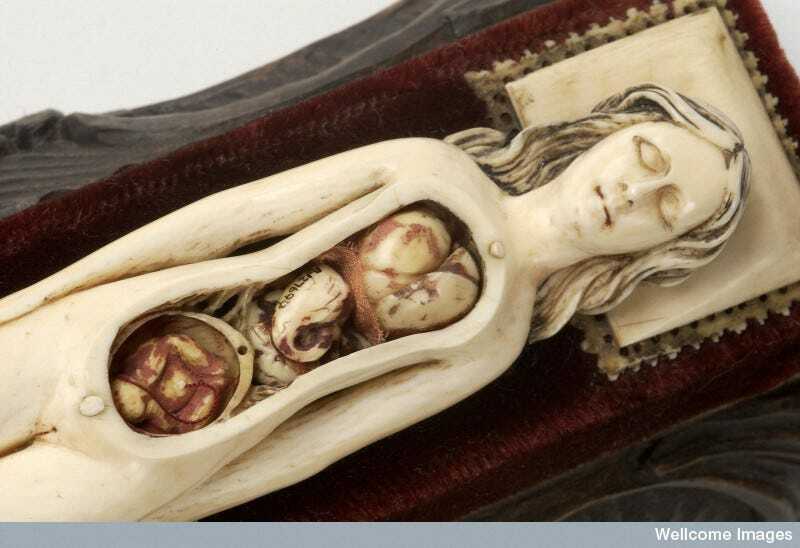 If you were a midwife or a doctor attending childbirths during the 17th century, you might have owned a tiny anatomically correct doll like this one. Carved from ivory by German, French or Italian craftsmen, these tiny anatomical manikins opened to reveal the normal arrangement of human organs, including the lungs, stomach, kidneys, intestines, and reproductive organs. Some dolls are male, but most of the ones that have survived depict heavily pregnant women and contain removable fetuses, sometimes attached to the interior of the uterus with a red thread depicting the umbilical cord. We don’t really know how the owners used these dolls: some historians think they may have been 3D references for teaching, or simply a way to show their clients that they thought women’s health was important.